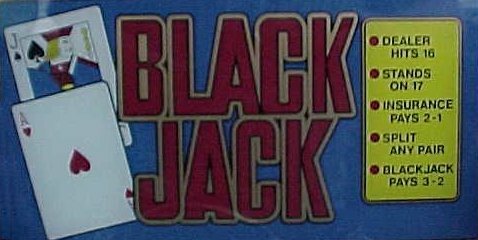 Blackjack is a betting game that is played by one or more players and a dealer. The maximum number of players is typically 7. 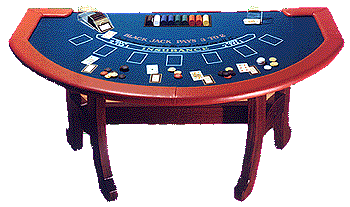 In a casino, the game is played on a specially designed table with layouts reflecting spots for bets with written information on specific rules. These tables typically have room for a dealer chip tray, a card dealing shoe or shuffling machine for multiple deck and a card discard tray. The object of the game of twenty-one, also known as blackjack, is to beat the dealer. This is accomplished by obtaining a hand that totals higher than that of the dealer, but not greater than 21. It can also be accomplished by having the dealer bust or go over 21. If the player busts before the dealer then the player automatically loses even if the dealer subsequently busts as well. One to seven players typically play against a dealer with players placing their bets before the deal. The dealer deals cards from his left to his right, one card at a time. The players and dealer get two initial cards. Most multi-deck games are dealt face up and most single deck games are dealt face down. The dealer receives one of his cards face up, called the up-card, and one card face down, called the hole-card. The 2 through 10 cards are worth their face denomination. Jacks, queens and kings are worth 10 points and the Ace is counted as either 1 or 11. A hand with an Ace that can be totaled as an 11 without the hand exceeding 21 is called a soft hand. For example, a hand consisting of an Ace + 3 + 3 would be called a soft-17. All other hands are called hard hands. Casinos typically use from one to eight decks of cards. Single and double deck games are usually hand dealt and all other games are dealt from a shoe. The cards are shuffled by the dealer and cut by one of the players by inserting a plastic card in the stack of cards. After the cut, the top card is usually removed (burned) and placed face down in the discard tray. A general rule of thumb is that the fewer the number of decks the more advantageous it is for the player. If the first two cards you or the dealer receives are a 10-valued card and an Ace, then that hand is called a blackjack or a natural. If the player gets a natural, he receives 3 to 2 on his original bet (i.e., a $5 bet will win $7.50). If the dealer gets a natural, all players who do not also have naturals lose. The hand is tied (pushed) if both player and dealer have naturals. You should never play in a game that does not reward players with at least a 3 to 2 payoff on naturals. See 6:5. Each player may take additional cards as long as the hand does not total more than a hard 21. In face up games, players signal for a hit by scratching the table-top with their finger or fingers. In face down games, players should scratch the table-top with their two cards. If the player is satisfied with his hand he may refuse additional cards and stand. In face up games, players signal standing by moving their fingers or hand in a lateral motion over their cards. In face down games players should slide their cards face-down under their bet. If the player’s hand exceeds a total of hard 21 he has busted and automatically loses the hand. If the dealer busts, all players who have not already busted win the hand. After the player receives his first two cards he may double the amount of his bet and draw one more card only. Some casinos let you double down on any two cards (e.g., Las Vegas Strip rules) while others only let you double down on a specific total such as 9, 10, or 11. It is to your advantage to only double on specific hands against specific dealer up-cards as indicated by the basic strategy for the game. Players are usually allowed to split two identical initial hand cards into two separate hands. This requires placing an additional wager equal to the original bet. To split a hand the player should place extra money next to his bet and signal the dealer his wish to split. The dealer will separate the cards to create two hands. Many casinos also allow splitting and re-splitting of pairs up to four hands or more. Like the doubling down option, it is to your advantage to only split specific hands against specific dealer up-cards as indicated by the basic strategy for the game. Double after splitting on a hand is allowed in many casinos but usually only in shoe games. For example, lets say the player splits a pair of 8s. If he receives a 3 on one hand and a 2 on the other he has two hands totaling 11 and 10. If we assume the dealer’s up-card was a small card (6 or less) then it would be in the player’s best interest to double down on each of these hands. It is always nice to see this rule offered. The surrender option is allowed in only a few casinos. After the player has seen his first two cards he may declare that he wants to surrender and forfeit half of his original wager. Usually, the player may not surrender if the dealer has a blackjack. If the player is allowed to give up half of his bet before the dealer checks to determine whether he has a blackjack we refer to this rule as early surrender, otherwise it is called late surrender. Like doubling down and splitting, it is to your advantage to only surrender specific hands against specific dealer up-cards as indicated by the basic strategy for the game. Insurance is allowed in most casinos. The dealer will ask all players if they want insurance whenever he has an ace up-card. This is a side bet which requires you to bet up to half of your original bet. If you take insurance you are wagering that the dealer has a blackjack. If the dealer has a blackjack, the player is paid off at 2 for 1. You should never take insurance unless you are counting cards or have other information that makes you suspect the dealer has an ace in the hole. Dealers may attempt to fool you be asking you if you would like even money whenever you have a blackjack and the dealer has an ace up-card. Remember… even money is the same as taking insurance! Whenever the dealer has a ten-valued card or an ace showing there is a possibility of a dealer blackjack. In the early days all dealers used to peek under both tens and aces. Today, you will only occasionally see dealers peek and when they do it will usually be under aces only. In many casinos dealers do not peek at all and simply wait until all players have completed their hands before revealing his hole-card. In many casinos today, tables are equipped with special electronic sensing devices and special cards are used to detect an ace in the hole. If the dealer manually peeks under tens there is always the possibility of the dealer giving off a tell and there are strategies to exploit this dealer weakness. See no-peek devices. The dealer must play by strict rules and does not gain any advantage by seeing the player’s cards. The dealer must hit until he has a total of 17. In some casinos the dealer will hit a soft-17 (Downtown Las Vegas and Reno rules) and in others they will stand on soft-17 (Las Vegas Strip rules). It is better for the player if dealers stand on soft-17. If the player and dealer both have the same total (under 21) the hand is considered a tie or push. No money exchanges hands. It is generally not a good idea to ever play in a game where dealers win pushes. Your first step to winning at blackjack is the mastery of basic strategy and an understanding of the effect of rule variations. Don’t take basic strategy too lightly. As a card counter you will be referring back to basic strategy about 75% of the time. At best, a good card counter can only hope to win between 1 and 1.5% of all the monies wagered across the table. A few basic strategy errors here and there will completely wipe this advantage out. Refer to the basic strategy section of this book for further details.